How to calculate volumes of the other solids? Thanks to our rectangular prism calculator you can easily find the cuboid volume, surface area and rectangular prism diagonal. Whether you are wondering how much water your fish tank holds or you're trying to find out how much paper you need to wrap a gift, give this rectangular prism calculator a go! If you are still unsure how it works, keep scrolling to learn about rectangular prism formulas. Right rectangular prism is a 3-dimensional solid which has six rectangular faces. Rectangular prism can also be oblique - leaning to one side - but then the side faces are parallelograms. Right rectangular prism is also called cuboid, box or rectangular hexahedron. Moreover, the term "rectangular prism" and "right rectangular prism" are often used interchangeably. volume = h * w * l where h is prism height, w is its width and l its length. Find the box length. For example, it can be equal to 18 in. Determine its width. You measured 12 in. Find out the rectangular prism height. Assume it's 15 in. Calculate the cuboid volume. Using the rectangular prism volume formula above, we get volume = 18in * 12in * 15in = 3240 in³. Let's come back to our example with the box - how to calculate the cardboard area? Calculate the rectangular prism surface area. First rectangle area is 15in * 12in = 180in², second 15in * 18in = 270in² and third one 18in * 12in = 216in². Add all three rectangles area - it's equal to 666 in² (what a number!) - and finally multiply by 2. The surface area of our cardboard box is 1332in². 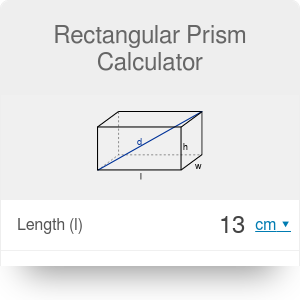 Or save yourself some time and use our rectangular prism calculator. How to determine the diagonal of a rectangular prism? Do you have the feeling that you saw the formula before? Yes, that's possible, because this equation resemble the famous one from the Pythagorean theorem! Make sure to check out the volume calculator - volume of basic 3D solids, all in one place! Rectangular Prism Calculator can be embedded on your website to enrich the content you wrote and make it easier for your visitors to understand your message.